Break out the sunglasses because this is probably going to be the most colorful Thanksgiving celebration you’ll see this year. There’s not a spec of brown to be found. But there is a whole lot of neon! 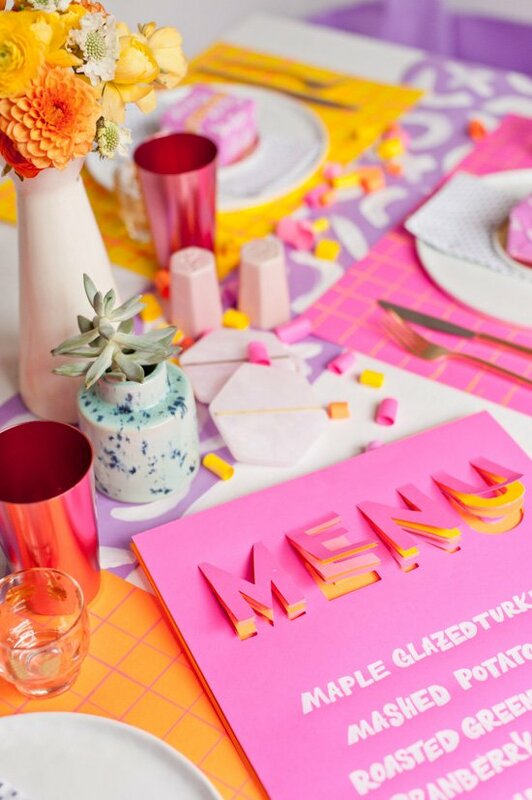 I teamed up with Astrobrights again this year to bring you an alternative Thanksgiving celebration, filled with DIY paper ideas and loads of…well…color! 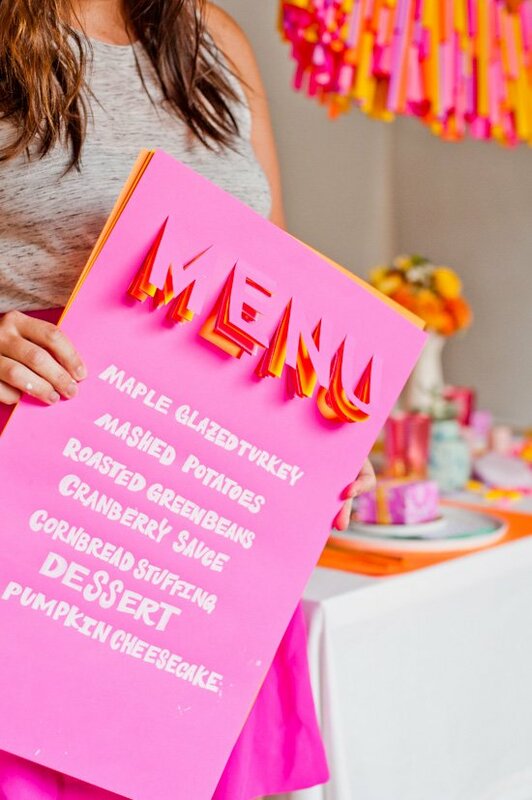 If you don’t know about Astrobrights already, it’s an awesome line of vibrant color paper products. I use their paper for lots and LOTS of craft projects, not just for the holidays. 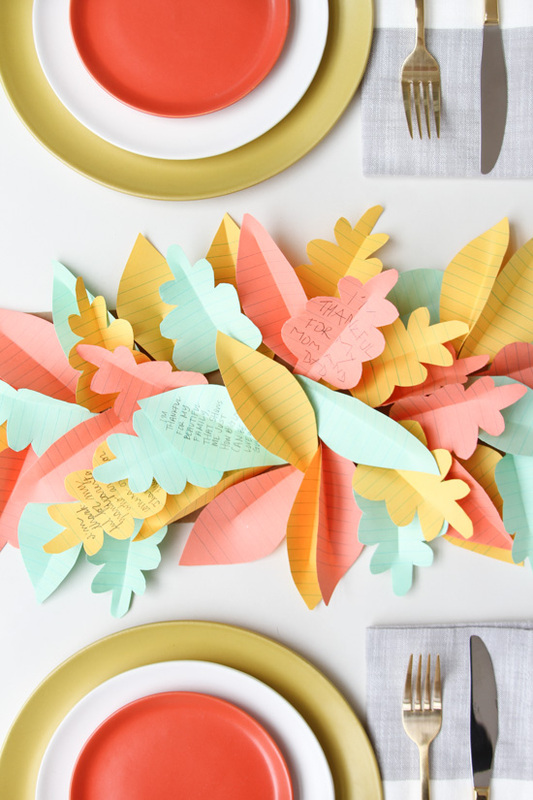 But I especially love using them this time of year because you can make such a big impact with paper, without having to spend a ton of money on decor. 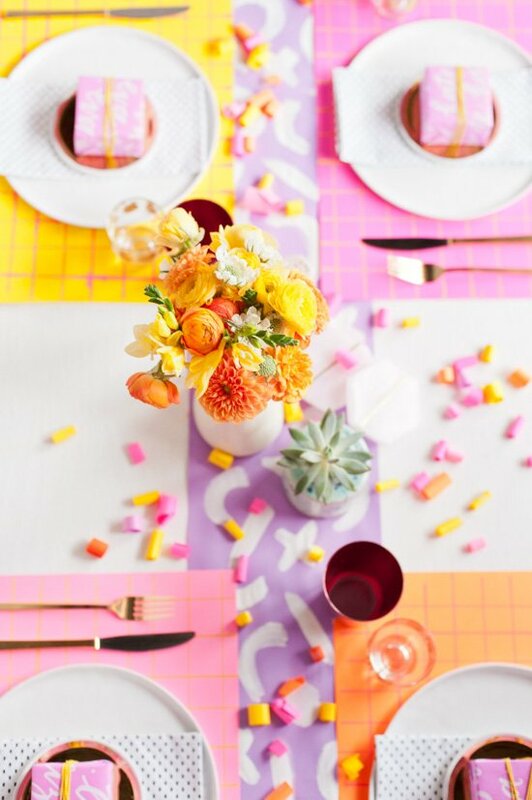 Using larger sheets of Astrobrights paper (12.5 x 19 inch), we created pattern placemats and a table runner. 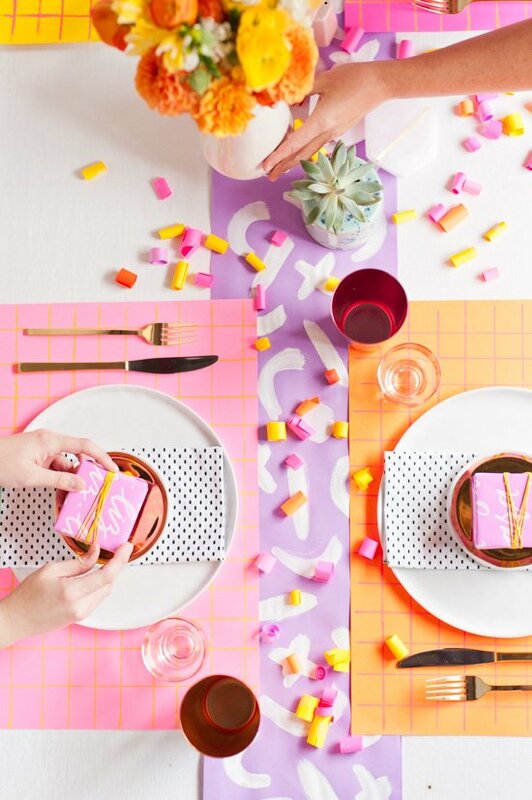 The grid placemats were created using a paint pen and a straightedge. And the table runner was done with acrylic paint and a paint brush to create an abstract pattern of shapes. My favorite piece! 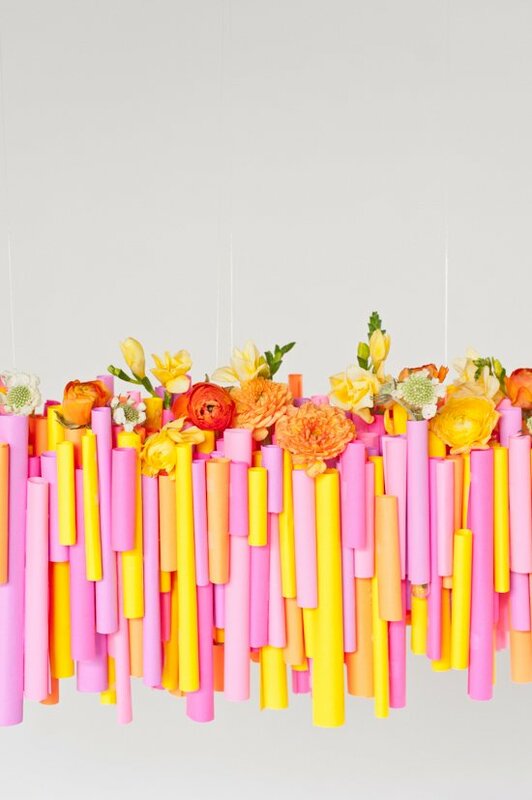 The hanging chandelier is made from rolled up pieces of paper, that were then hot glued together, over and over again. I think we used about 250 pieces of rolled paper (all different heights). After the structure was completed, we used fishing line to hang it over the table. FYI, the string was threaded through cardboard ‘buttons’ underneath (so that it doesn’t stress the paper) that we placed equidistant the length of chandelier and string through the top to hang. 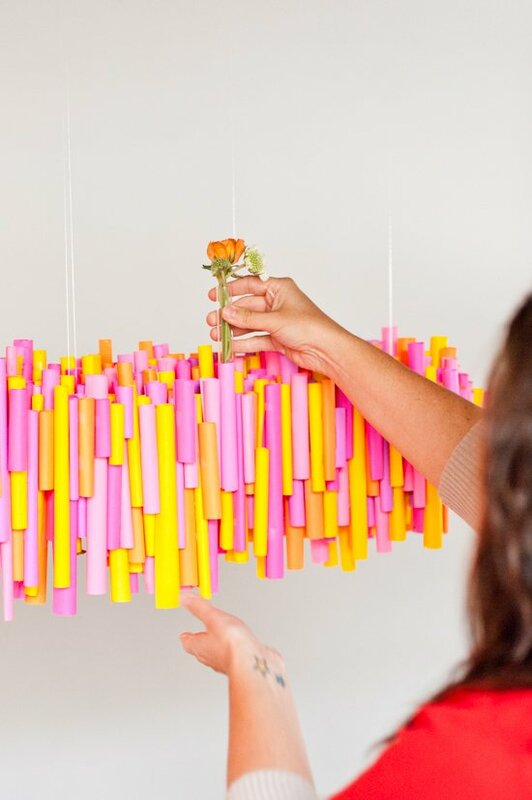 And if you want to add flowers to the top of the chandelier, grab some test tubes (mine are from Amazon), fill them with water, and add your flowers. They fit really well in the rolls of paper, but just be careful to choose ones that are a snug fit because if you have a roll that is too big, the test tube will fall right through. 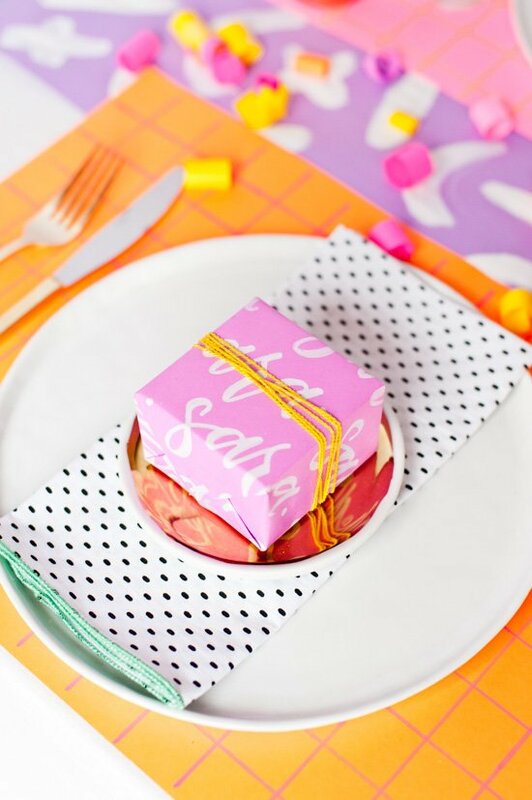 Create custom wrapping paper for small gifts for your guests to take home after the Thanksgiving feast is over. 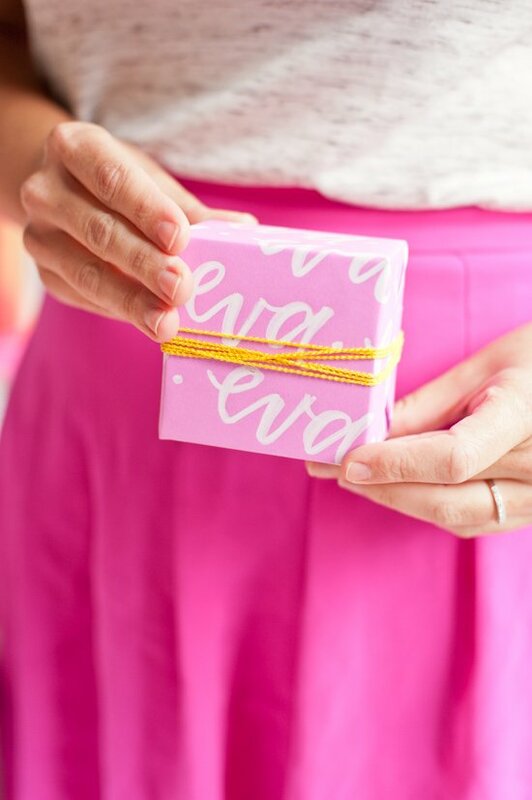 Just write each guests name, with a paint pen, over and over again on colorful paper and wrap as usual. 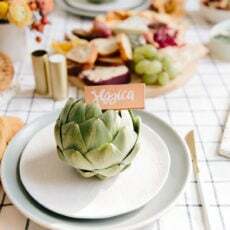 Then rest one wrapped gift at each place setting to signal where each guest should sit. 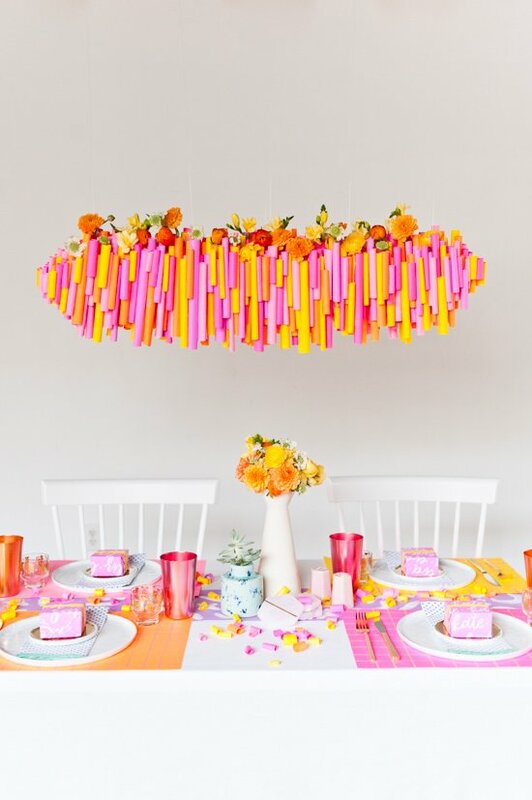 Cut leftover paper rolls from the chandelier into smaller pieces that can be used a three dimensional tube confetti. Super easy! This is a fun one! 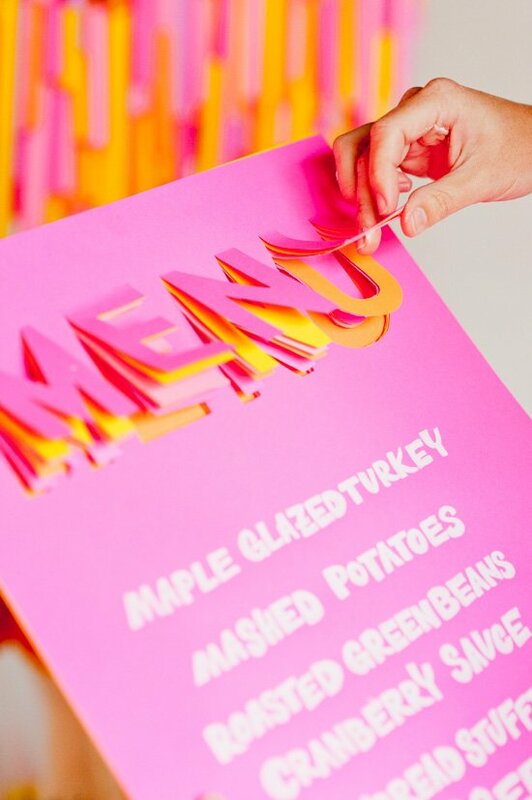 Using a stencil as a guide (or freehand it, if you feel comfortable), cut the word MENU in the top center of of at least 6 different colors of paper, with a sharp blade. Be sure not to cut the very top of each letter, so that you can get a pop up look. Once the cut outs are done, fluff up the layers by slightly folding them upward. Then write your menu underneath and glue the pages together. 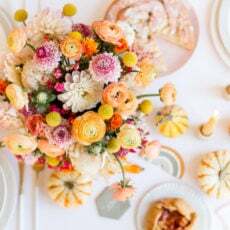 I realize that a super colorful Thanksgiving table isn’t for everyone, but I love the cheerfulness of it. If nothing else, it would be a great Friendsgiving option. Find more inspiration and ideas to Colorize your life at COLORIZE.tumblr.com. Think you’ll Colorize your Thanksgiving dinner table this year? 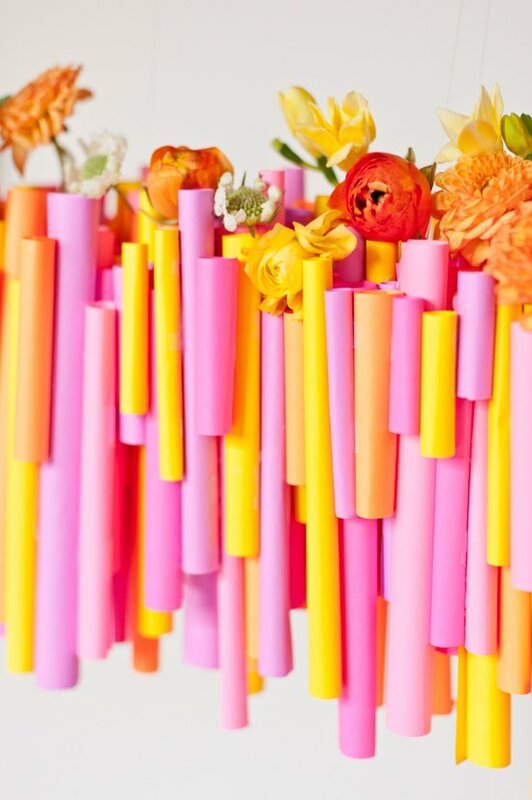 I’d love to hear what you think of these DIY ideas. This post is in partnership with Astrobrights. Thank you for supporting the brands that help keep Paper & Stitch running. WHOA, simply incredible! The chandelier is amazing – and the details are great. WOW is this all stunning!! 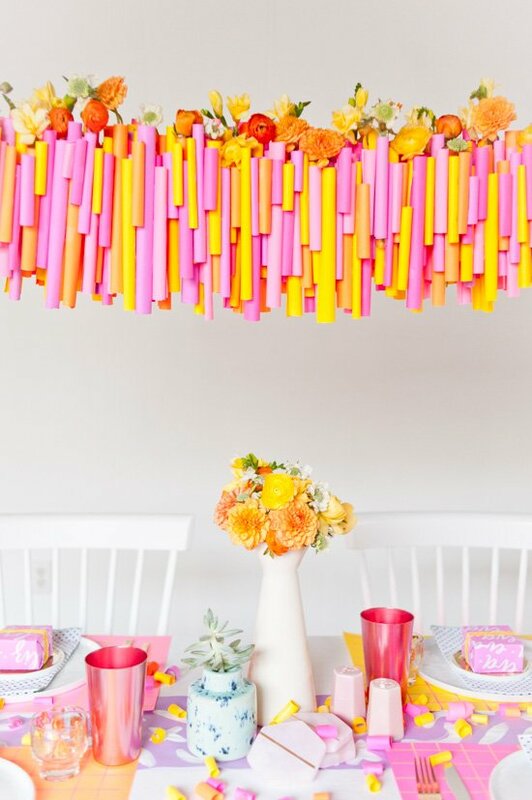 The paper chandelier is amazing. And how fun is the Menu idea. Pinned both! Thank you Amy! Glad you like the menu and chandelier. This hanging chandelier is absolutely amazing, I fell in love with it the second I saw it! Aw, thanks Michelle. I love the hanging chandelier too. It was a labor of love, for sure. So pretty and colourful, I love it! WOW!!!! This is so incredible, Brittni! 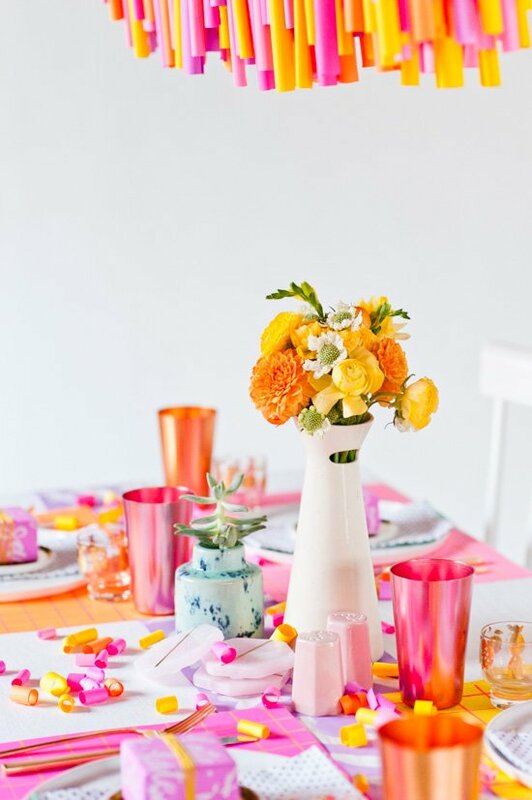 I love all of this colorful inspiration! Awesome!! Wow this is INCREDIBLE! Love the colors so much, will try to make an illustration with the same color theme (and if I do I will of course link back to you). Have a good day! Thanks Caroline. Can’t wait to see what you come up with. HOLY MOLY! This is unreal!! I’d definitely prefer to throw (or attend!) 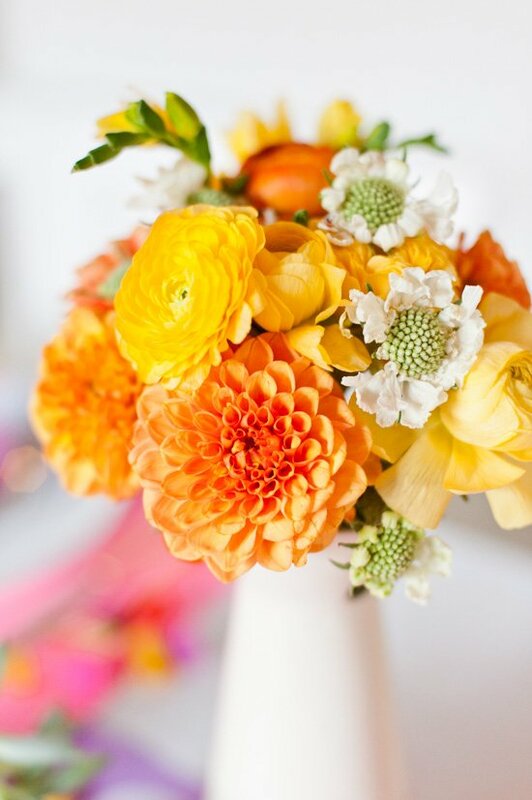 a Thanksgiving this colorful! That chandelier is out of this WORLD! I could totally picture you doing a super colorful Thanksgiving, Kel. Thanks! Goodness, I love all of these details! 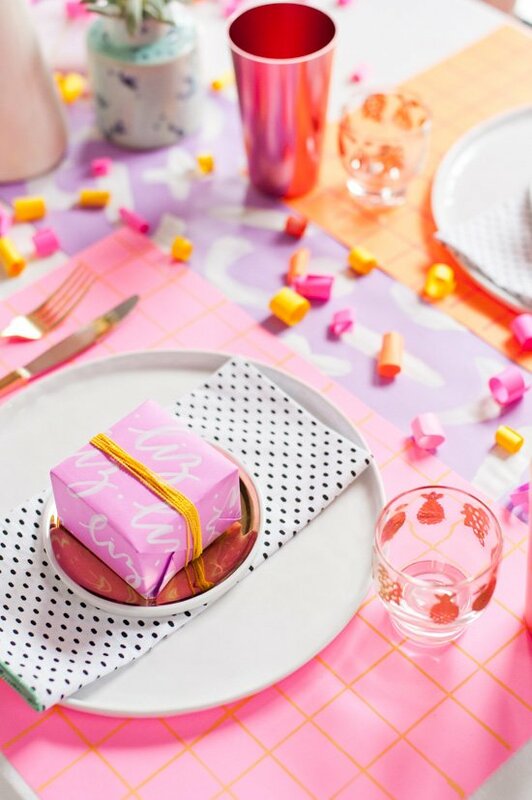 And those place card favors are BOMB. Simply gorgeous! B, that chandelier is AMAZING!!! This is ridiculously stunning, B! Absolutely love it! That chandelier is totally amazing.